Have you started your Christmas shopping yet? I personally have bought a few things online, but I still have a lot to get. Every year I decide to start earlier but I still end up getting a few things at the last minute. I guess it is part of the holiday fun! Just a quick reminder if you have not seen already, if you shop with us during the month of December and you spend $100 or more in our shop, you will get a FREE GIFT! The gift will either be a scarf or a jewelry piece. We also offer “Gift Certificates” for any amount $50 and up. They are available under our shop category “Gift Certificates” and they also qualify for free gift as well over $100. Today’s look is a casual yet chic look to throw on to go holiday shopping, lunch or drinks with girlfriends or any other fun occasion when you want to look chic yet be comfy as well. Depending on what kind of work you do, you can even wear it to the office. Unless your job is in a very corporate environment where you have to wear suits on daily basis. I have always loved turtlenecks or mock necks for fall. I think they are so chic, and they keep you warm at the same time. The best part is they are trending this fall and today I have a real cute one to debut for you. It is our Black Taupe Ribbed Stripe Mock Neck Top. Not only does it have a mock neck, it is also made out of soft ribbed knit in a great color combo of black and taupe, which is such a classic. I am wearing it with my black skinny jeans and added our Black Unstructured Moto Jacket. 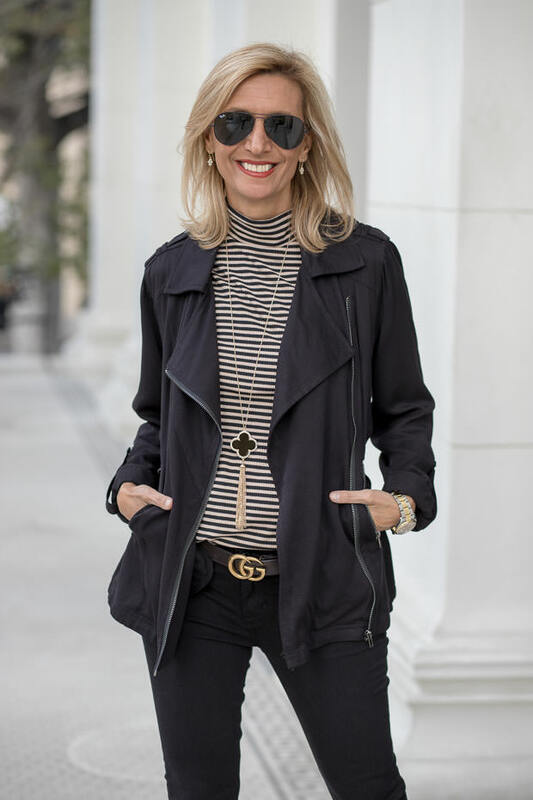 This jacket is a great throw on moto jacket that looks great over tops and jeans or even a skirt or dress. It has a removable belt, so you can wear it with the belt or without. I have shown you both looks. When I wear mine open, I tie the belt in the back to give the jacket a little more shape. As a second outerwear option, I also styled the top with our Coco Cape Vest with Fringe. Even though I am calling the color coco, it is almost the same as taupe so the color works perfectly with the stripe top. Many of you probably already have one of our cape vests which look great and are best-sellers. This piece is the same body and knit material with the only difference being the added fringe all around the it. 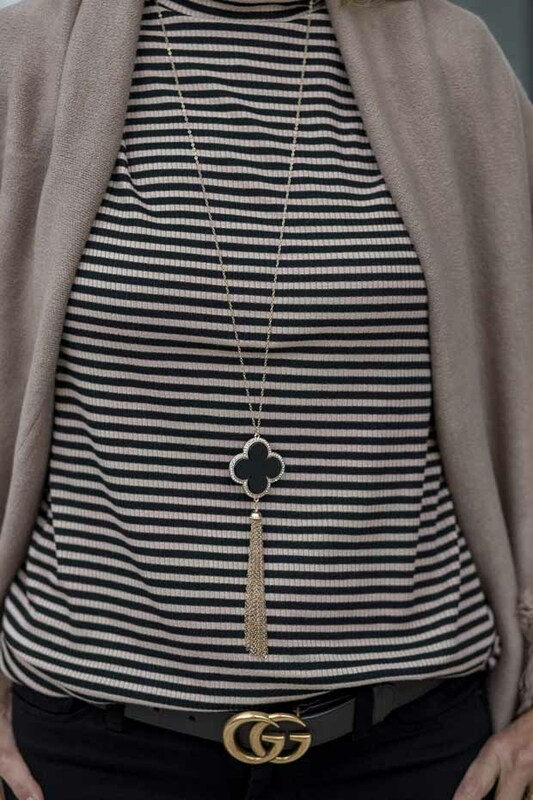 For jewelry, I added our Gold Tone Chain Necklace with Black Clover and Fringe. This is a simple yet pretty necklace in black that can work with many pieces. How do you like my looks? Just love that cape vest with the fringe, just a beautiful piece. I used to think black and taupe together was taboo, but now I love it and it is so on trend. Your outfits are always fabulous! You look so chic and I am loving that necklace!